A) Singling out Israel for BDS (Boycotts, Divestment, Sanctions) is morally hypocritical and inherently racist. B) Alice Walker is an antisemite with no moral authority by which to lecture the Jewish state and indeed has engaged in Judeophobic narratives including the following: evoking the ancient decide charge by conflating the “persecuted” Palestinians with Jesus Christ, advancing the odious charge that Israel’s sins can arguably be compared to those of Nazi Germany, and morally legitimizing a Palestinian women who prayed that God would protect her from the Jews. C) Whatever her literary talents, many of Walker’s political views are facile and downright juvenile and she represents an embarrassment to serious left-wing critics of Israel. For instance, she believes that Israel is the greatest terrorist organization in the world and has referred to Jews who live across the green line as being on a par with the KKK. D) Preventing Israelis from reading ‘The Color Purple’ denies Jews Walker’s liberating wisdom on how to combat their nation’s “primitive”, “sick” and “extensive” racism”. If you guessed (D), you’re correct. The Ha’aretz ideological bubble which Sela inhabits is evidently as blind to the ugly reality concerning very real regional enemies possessing undeniable malevolence (insatiable antisemitism, a collective desire to wipe Israel from the map, and terrorist movements on its borders which launch hundreds of rockets into its towns each year) as it is to the circular logic it often peddles. What Sela is essentially saying is that singling out the democratic Jewish state for sanction doesn’t suggest that Israel is the victim of a malicious movement intent on isolating it from the community of nations but rather that it erroneously reinforces the nation’s belief that it is being victimized. For Sela, the BDS movement is convenient for Israelis because, on some psychological level, it allows them to nurture the evidently fantastical notion that antisemitism (in its classic and anti-Zionist manifestations) is a malign and dangerous force. 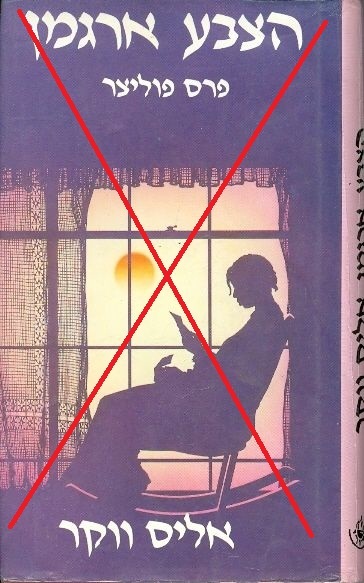 Whatever the powerful truths about the evils of racism imparted the book ‘The Color Purple’, Sela doesn’t offer her Ha’aretz readers so much as a clue regarding Walker’s profound blind spot when it comes to Israelis. Walker’s anti-racist street cred is necessarily eroded by an acquiescence to the most crude, often unintelligible, hate speech about Jews as such. Ultimately, Walker is only granted political legitimacy and moral authority by virtue of the failure of journalists like Sela to take her task (or even minimally hold her accountable) over this visceral loathing she seems to possess for one nation: the particular Jewish inhabitants of the state of Israel. Walker may have confronted racism in her own life but when it comes to Jews, she has come to represent the hate which hate creates. “It is precisely here in Israel that her voice needs to be heard, and in Hebrew. Perhaps the most acute pathos of the Israeli left is the failure to even marginally comprehend the ethical imperative of political and moral proportion. It is representative of a Western left, more broadly, which routinely engages in self-flagellation over every imaginable societal sin, without acknowledging that such social imperfections pale in comparison their profound progressive virtues and undeniable liberal advantages over the non-democratic world. This is the “sickness” which, as much as any other factor, continues to define the hard left: “intellectuals” who cannot distinguish between free nations consisting of imperfect citizens with ethnocentric biases and the capacity for toxic rhetoric (but where such behavior typically elicits social opprobrium) and nations where racism, intolerance (and violence) directed against “the other” is normative, and encouraged by the state, religious leaders, the media and popular culture. Guardian protegés such as Ha’aretz journalist Maya Sela are also plagued by an acute moral myopia – the willingness to bestow liberal anti-racist credentials to nearly anyone who fancies themselves anti-Zionist. A genuine intellectual left – one with a serious moral claim to that mantle – would immediately exclude any “activist” from the progressive community who, like Walker, engages in tropes about Jews which are indistinguishable from those employed by the extreme right. Alice Walker is no anti-racist and Jews need not take seriously her self-righteous, and supremely hubristic, lectures on intolerance. A genuinely progressive Israeli voice would understand this intuitive truth. In the end, we always come back to the same point: Israel’s settlement policy 1 – is a violation of international law; 2 – destroys the country’s standing in the Western world. Well, you always keep coming back to (1) despite being wrong, and despite this wrongness being pointed out to you. As for (2) the reputation of Israel is traduced by racists who lie about her on a regular basis. It would be interesting to discover what would happen to the ME peace process if noisy racist cat-callers were not to constantly impede it. Any Israeli settlement located in the occupied Palestinian territory (West Bank, east Jerusalem and the Gaza Strip) is a violation of international humanitarian law. Excellent. Now, instead of just plain old boring “international law” we now have Nat’s new comfort blanket – “international humanitarian law”. That makes Israel sound even more dispicable, doesn’t it Nat. Well done. And of course Rebecca Walker has two children who have never met the grandmother who shunned them. It’s hard to decide which is the most odious – Alice Walker and her nasty antisemitism, Maya Sela’s morally inverted piece of trash, the usual anti-Israel and antisemitic comments by many of the Guardian’s readers or the Guardian itself. I think I’ll vote for the the Guardian itself for publishing Maya Sela’s noxious CIF piece, but the real answer is – all of the above. Thank you Adam for this well-argued analysis of Alice Walker and her sympathizers. Israel has two official languages, Hebrew and Arabic. Alice Walker’s refusal to permit translation into Hebrew (but not Arabic) was targeted only at Jews not Israelis, and is clearly anti semitic. ALice Walker is a racist. Andy, many Israeli Jews are Arab Jews from countries like Iraq or Lebanon, and they can read in Arabic. Why shun your fellow Jews in your comment? Most 2nd generations do not. At least not in depth. Many Israeli soldiers are Druze or Bedouins which can speak and read fluent Arabic. Alice is happily allowing the forces of the occupation to read her book but no many left wingers from the peach camp who happen not to speak Arabic or english. You are asking of us Israelis to stop defend the indefencable yet you are doing just that. Is there anyhting positive about Israel you can actualy point out to or is it the devil’s right hand man for you? I’m trying to imagine the Bedouin army guys I know reading “The Color Purple”. I fail. They’re either Big Literature types, or Maxim Magazine types, or both. BTW instead of Iraq and Lebanonn people who know Israeli Mizrahi communities normaly say Iraq, Yemen, Morroco, Tunis, Egypt, Lybia etc. Lebanon comes near the end. I’m interested that her last name seems to transliterate as “Wakker”. I have family called Walker, and the “L” is distinctly, although very softly, there. Maybe including a lamed would lead to Israelis saying “Wall-kerr”. I doubt the Israelis will add the “L”. The original name is alwaqys inside in the original language in case further clarification is required. I don’t like the focus on some of the messages here being fixed on Walker’s personal problems. The facts about how she is spouting her insanely false views on Israel would be disgusting even if she was a good person; her being a cretin doesn’t make that message any different. I suppose in general I would rather focus on what people say and do than what they’re like in their private lives (unless they’re more strongly connected than this example indicates). I had similar thoughts about the ‘something inside us is sick’ bit.